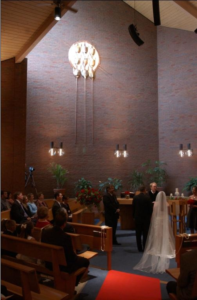 North Hills provides a beautiful and sacred space to celebrate the uniting of a man and woman in holy matrimony. The building is a contemporary structure, with accents of oak and copper and interior furnishings hinting at the Arts-and-Crafts style. The 200-seat sanctuary is designed with a “nave in the round” concept: the congregation literally gathers around a central Lord’s Table, pulpit and baptismal font in four sloping bays. Natural light from an expansive clerestory window floods the space with natural light. The air-conditioned sanctuary has a state-of-the art sound system, an 8′ Yamaha Grand Piano, a two-manual Allen Organ and solid oak seating. In all, it is a remarkably simple, beautiful and sacred space. You may also rent the sky-lighted Fellowship Hall for your reception. For a sit-down dinner, the Hall can accommodate up to 130 diners; for a stand up hors d’ouevres reception, many more guests could be accommodated, and the adjoining, beautiful Atrium could also be utilized. You would have access to our chairs and tables as well as the kitchen. The Fellowship Hall is not available on Saturday nights. The Atrium’s floor to ceiling windows flood this space with light, and give full panoramic views of the memorial garden with its brick walkway, teak benches and striking bronze sculpture by the late Douglas Chick. 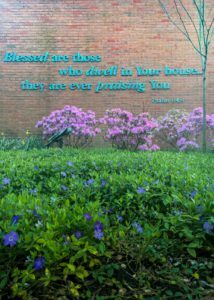 The garden is canopied by 30-year old redbud trees planted by the church’s first pastor. The garden is dramatically lit at night, and is also viewed from the Fellowship Hall. We ask an up-front deposit for damages and refund the balance to you afterward. We reserve your date when we receive your non-refundable deposit, which is then applied to your total fee. The balance is due one month before your event. Contact the office to arrange dates and to request a building use packet which contains more information, an application and fee schedule. 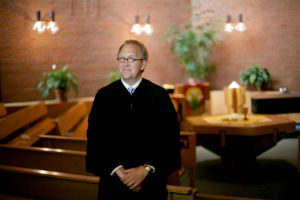 *The church’s pastor must be the officiate. He is also available for pre-marital counseling.